Folded, it's no bigger than your car key! 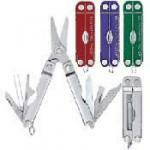 This Leatherman is the smallest Multiplier of all! Folded, it's only 2" long by 1/2" across and 3/16" thick. It's tiny, but extremely useful. Goes perfect on your key ring or for carrying in pocket and purse. Opens like a standard leatherman, but looks what's inside: Scissors with a full one inch blade, tweezers, phillips head screwdriver, bottle opener, eyeglasses and "greenie"-type screwdriver, fingernail file and nail cleaner, slotted screwdriver, plain edge knife, and a 5" ruler! It comes with a tiny split-ring key ring to attach it to your own key ring or lanyard. Solid, quality construction. This is a perfect gift item. The Micra comes in four colors: stainless steel, red, blue or green. Extremely sharp "Spyder Edge" stainless steel blade really holds its edge. Police and paramedics choose the Spyderco to make fast cuts on auto seat belts in emergencies. The serrated version is a great heavy duty rope cutting knife. A stagehand's working partner. Best overall for what we do is the partially serrated blade. Patented thumb hole at the top of the blade lets you easily "flick" the locking 3 3/4" blade open with one hand. This knife conforms to your grip--fits naturally and comfortably in your hand. Features the bold feel of solid steel. 5” closed with a 3 3/4” half-serrated, locking blade. Lightweight, high tech design features a rubberized Zytel grip with an alligator hide pattern for slip resistance. Nylon sheath included. Made in the USA. Sleek design with an exceptionally smooth action. Designed by Ken Onion. Apply pressure to the thumb stud and watch the blad3e fly open. Knife is 4 3/8” closed. Pocket clip. 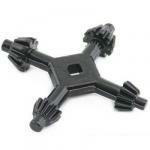 Durable polyamide grip. This is a spectacular knife. Marlin Spike Knife Here’s a flyman / yachtsman’s dream. A Marlin Spike Knife with the perfect combination of marlin spike and blade for splicing rope. Locking Marlin Spike with half-serrated 2 3/4” blade Made in the USA by Camillus. Same as the IA Knife without the custom engraving. Several finishes: brushed stainless steel, shiney black, and rainbow. Black knife is specially treated to be practically totally unscratchable keeping it's black beauty for many years to come. 2 7/8" long closed with a 2" blade. For Serrated and plain edge blades. Perfect edges every time. Four Hones. This system never fails to produce the best sharpened blades on my personal knives. When using the Lansky knife sharpening system, you know your blades are being sharpened with the same perfect angle on both sides of the blade. As you draw the hone across the stationary blade, the hone stays at exactly the angle you choose. You can't make a mistake. The Lansky universal knife sharpening system comes with three synthetic flat hones for your plain edge blades: course, medium and fine. The fourth triangular ceramic hone is especially designed for serrated blades. 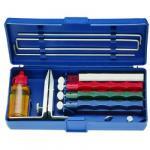 In addition to the four hones, the universal kit comes with blade vice, hone rods, oil, and durable carrying case. Four diamond hones mean fast sharpening. 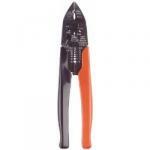 Sharpens serrated and plain edge blades. Perfect edges every time. On the surface, the Diamond Lansky knife sharpening system looks just like the standard except the difference, of course, is that the diamond system uses quick cutting diamond hones to sharpen your knife blades to a perfect edge every time. And here's something special you get from TOOLS FOR STAGECRAFT. Normally, the diamond Lansky knife sharpening system only comes with three flat diamond hones. As with the standard system, I realize the importance of being able to sharpen serrated blades. That's why I add a forth hone -- a ceramic triangular hone to sharpen those serrated blades. Anywhere else, you'll find the diamond system includes three flat hones only. The four-hone diamond Lansky knife sharpening system for plain and serrated blades is special from TOOLS FOR STAGECRAFT. When using the Lansky knife sharpening system, you know that your blades are being sharpened with the same perfect angle on both sides of the blade. As you draw the hone across the starionary blade, the hone stays at exactly the angle you choose. You can't make a mistake. The Special TOOLS FOR STAGECRAFT Lansky diamond knife sharpening system comes with three diamond flat hones for your plain edge blades: course, medium and fine. The forth triangular ceramic hone is especially designed for serrated blades. In addition to the four hones, our diamond kit comes with blade vice, hone rods, oil, and durable plastic carrying case. When sharpening with the diamond hones, lubricate the hones with water instead of oil. For sharpening serrated blades. If you already have a Lansky knife sharpening system, you probably don't have the ceramic triangular hone for your serrated blades. Upgrade now so you can sharpen ALL your knives. Hone includes guide rod. Diamond coated steel tapered rod. Very convenient. Want a diamond knife sharpener that you can carrying in your tool bag? When you need it, just whip it out and it's ready for action! This tapered diamond coated steel rod folds into its own handle for storage like a butterfly knife. It's an excellent sharpener for your Spyderco serrated knives as well as any other serrated or plain edge knife. Fast, easy durable and easy to toss into your tool bag. Sharpening rod is 4 1/2" long. When sharpening a serrated blade, choose the thickness of the rod that matches your knife blade serration and push the sharpener forward. That's all there is to it. And it's fast because it's diamond. Ballistic Nylon with belt loop and Velcro flap. Comes in three convenient sizes. 4" Fits medium knives like the Spyderco Delica. 5" Fits large knives like Spyderco Endura, Camillus Marlin Spike or Kershaw Blackout. It's a stripper. It's a bolt cutter. It's a crimper. Simply the best tool of its kind. My favorite feature on this superb tool is the wire cutter at the tip of the tool where it belongs. Allows you to work in tight places. Crimps insulated and non-insulated Sta-Kons. Cuts threaded bolts cleanly and easily. Wire strippers for various gauge wire. Locks in closed position for storage. Truely the best. Stripping rubber-jacketed cable has never been easy, until now. Strip any size cable up to 4/0 with ease. Pull out the spring-loaded angled keeper and release it into place around the cable. Spin the stripper around the cable until it's cut to the depth you've set. Then just push the lever to turn the blade 90 degrees and pull the stripper off the cable. Voila! The insulation is cut all the way from the circular cut lengthwise to the end of the cable. Never use dangerous razor blades again. Unique curved jaw increases your leverage. 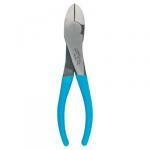 The Channellock 447 curved jaw diagonal cutters are terrific especially when it comes to pulling nails. Increased leverage helps you get out nails driven into corners and other hard to access places. Got yourself in a tight situation? Use your Channellock 447. Keep losing your chuck key? Here's a universal chuck key that fits over 86 different models. Need to draw a circle...a really BIG circle? Every good carpenter needs a set of quality trammel points. Layout and cut perfect circles and arcs every time no matter what the size. When placing screws, I always use my finder/driver. 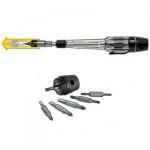 It can be used on any drill/screwgun. 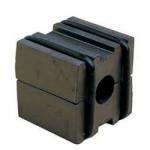 It magnetically holds in place any bit you choose and it has a sleeve which slides over the screw. This is great for placing screws in hard to reach places. I've found another good use for the finder/driver. Use it when hanging wall sconces. It happens so often, you can't get your screwgun in between the prongs of a sconce so you can't screw the mounting plate to the wall. The additional length of the finder/driver allows you to get into those tight places. The finder/driver comes with two bits: one slotted, one phillips. Checks for electrical current without breaking the connection. 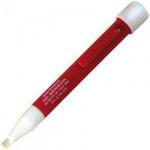 A "volt tick" is a handy tool that belongs in every electrician's toolpouch or shirtpocket. Got a bad lamp? Check to see if it's getting current quickly and easily by just TOUCHING THE CABLE with the tip of the tester. It tests for voltage right through the insulation! The Santronics AC Sensor is powered by two AAA batteries. To replace the batteries, just unscrew the white cap. The The Santronics is always ready for use. It never has to be turned on or off. If there's current passing though the cable the entire white tip will glow a steady red. FAQ: John, I'm confused. I can't decide which "volt tick" to buy. Can you offer any help? Sure, it's really a matter of balancing personal taste with the situations you think you'll be using it in most. The Greenlee with its audible ringer is a good choice especially while focusing. There are always situations when you need to check a cable, but can't see the tester because you're blocked by the light. The ringer solves that situation. On the other hand, if you're working shows that are inherently quiet (soaps, theatre) the silent Santronics allows you to check cables without worrying about the noise of a ringer. I carry both the Greenlee and Santronics in my tool bag because I never know what situation I might be in. This one inch cube of magnetic power will magnetize and/or demagnetize your screwdriver. Pass the screwdriver back and forth through the hole in the center and magnetize your screwdriver. To demagnetize, pass the screwdriver back and forth along the slot on the outside of the block. 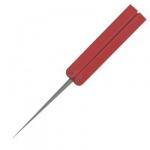 Will also magnetize/demagnetize individual bits used in multi-bit screwdrivers. Cuts electrical cable up to 4/0 in size with one hand. Cutting 4/0 electrical cable cleanly is no easy job. 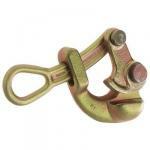 Unless of course you're using the Klein Ratcheting Cable Cutter! 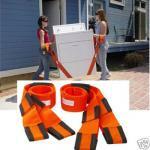 Make simple work of cutting or stipping electrical cable up to 1 1/4" thick. Cut through 4/0 with ONE HAND. 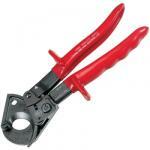 The ratcheting cutter closes like a pair of handcuffs. It tightens and cuts through the thickest cable as you ratchet it closed with one hand. And here's another great feature: you can stop at any point and remove the cable--that means you can strip cable with this cutter too! Every head electrician should have one. The Greenlee is powered by two button batteries. To replace the batteries, just pull off the black cap. Turn the Greenlee on by sliding the plastic protector up and then pressing on the metal shirt clip. If there's current passing though the cable you'll get an audible ring AND a flashing red light. Same design as the folding Serrated Knife Sharpener. Two different (medium and fine) diamond sharpeners on a flat double-sided paddle. Remove damaged screw heads, free spinning screws and damaged bolts. No other extractor does so much! It's simple, fast and easy to use. Two bits easily remove # 6 to # 14 screws. 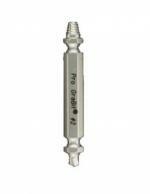 Extracts screws easily from wood, metal or plastic and removes screws made of any alloy, including soft screws.